Prague – a vibrant city with art around every corner. The National Art Gallery, The DOX and more let us have a glimpse into an artist’s work and marvel at one’s creativity. 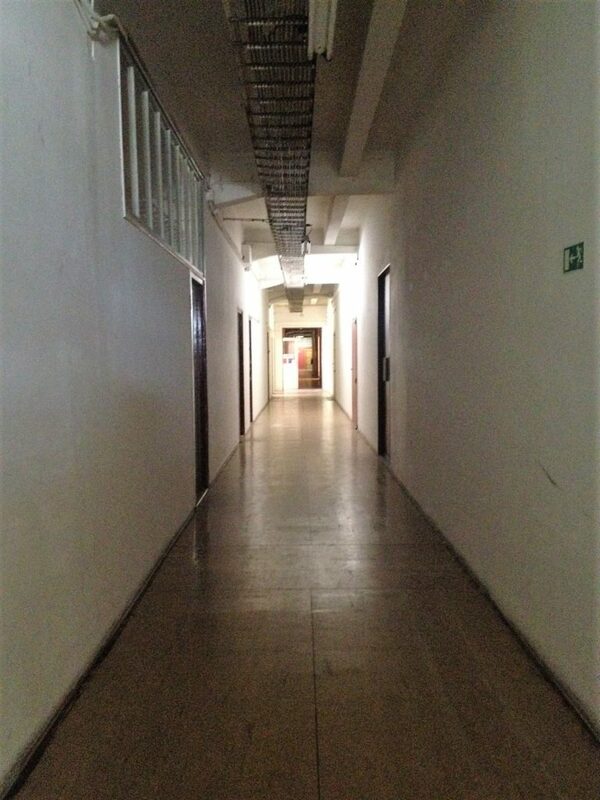 But what if we told you, there is more than just the big, well known galleries? What if we told you, there are so many more places where you can find art in this wonderful city? And what if you could marvel at local artists’ work? 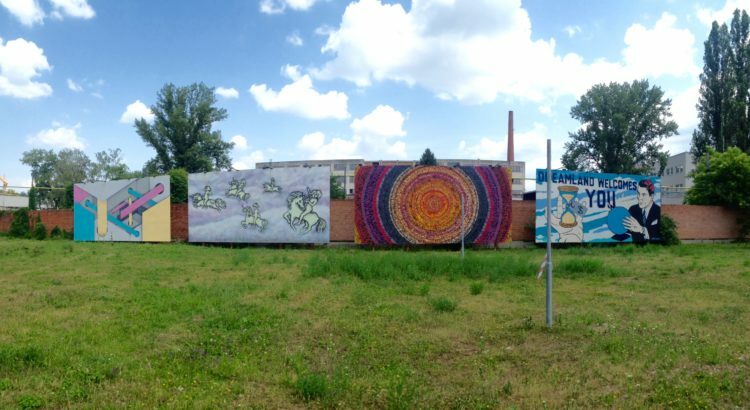 In our new series ‘ARTSPOTTING’ we explore alternative and vibrant places around Prague that display art, give local artists a platform and even let you make your own! Today’s stop on the art train: Pragovka’s Art Maze! 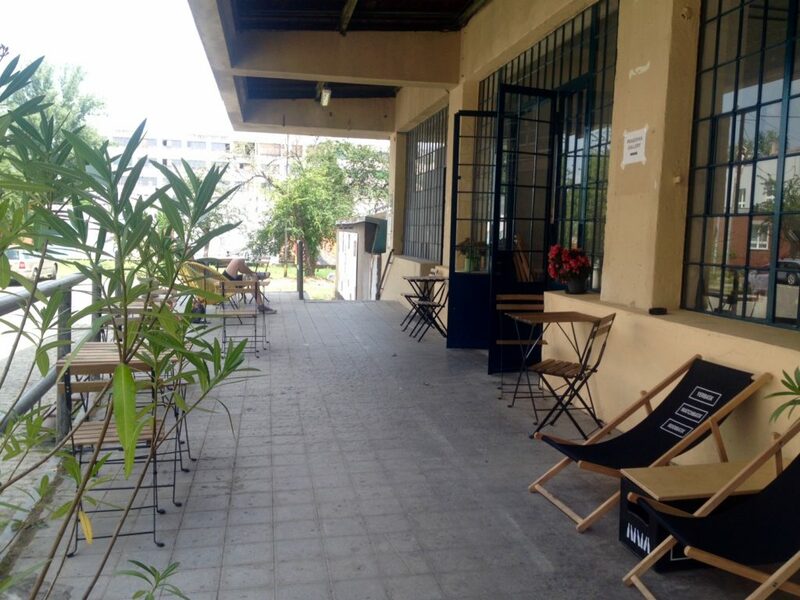 Dive into the newly created art space in Vysočany! 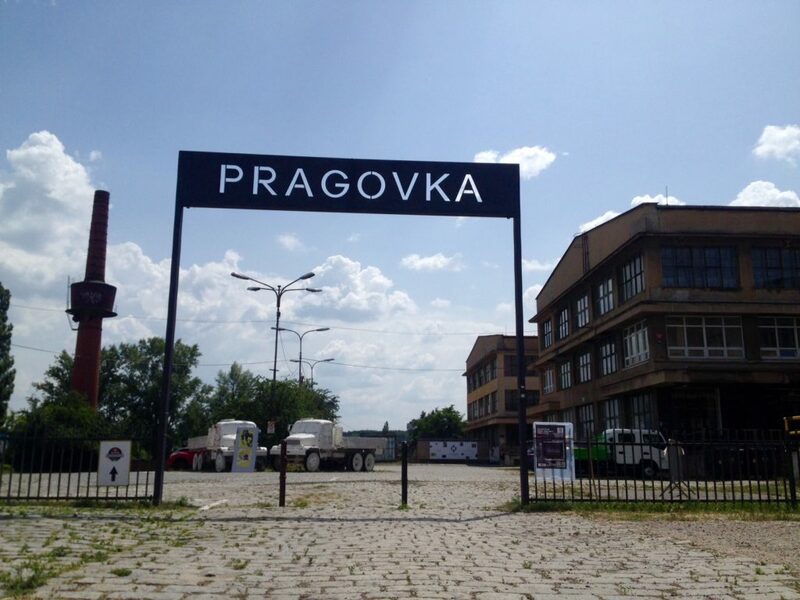 Where once ‘Praga’ cars were built, a space for artists arises. 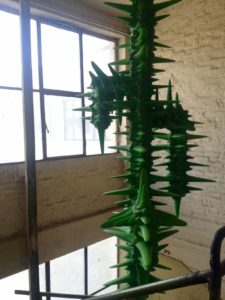 Pragovka emerged in the year of 2016 and inhabits over 40 studios, linking different artistic worlds and inspiring a creative community. What might look like an abandoned factory building is in fact a huge art space with fascinating works of young and local artists. Entering through the gate towering above the cobblestone pathway, a feeling of mystery and adventure inadvertently strikes one and stirs hunger for more. Standing in the middle of the courtyard, four massive canvasses catch ones eye – all of them different and yet cumulatively creating a first impression of the art space that leaves every visitor in awe. 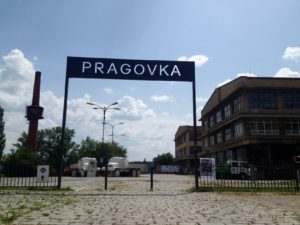 Finding treasures around every corner: It’s Pragovka! 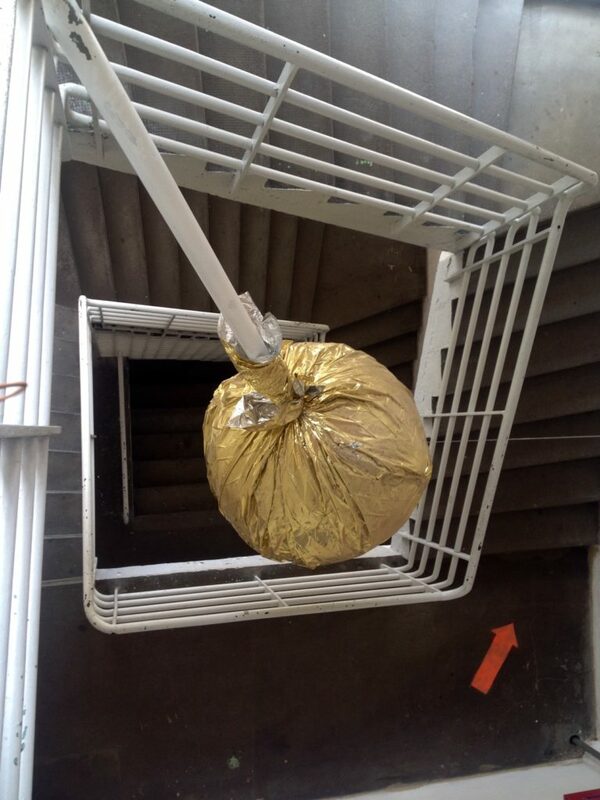 As we ascend the stairs to the tucked away entrance, we cannot help but feel the adventurer in us awakening. Do you dare going up these stairs of this old factory? Courage is being rewarded as the first installation awaits in the staircase that leads to the first floor of studios: A huge golden lollipop! As you make your way up, several orange markings lead the way to studios, ateliers and more of hundreds of artists. 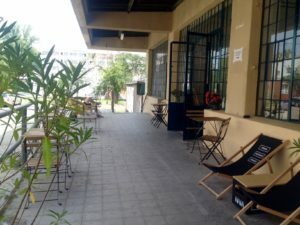 While some of them are closed – so the artists can fully focus on their work – some of them are wide open and invite one to take a look at the projects a local artist has completed. The maze seems endless: Four stories high, countless hallways and old corridors make Pragovka the most exciting place to discover hidden talents and wonderful people. But Pragovka is not just providing artists with space, they also plan all sorts of events like exhibitions, bazaars and concerts! In order to spice up your summer, they also came up with a gorgeous idea on how to use the massive courtyard: A Summer Cinema! And instead of screening Hollywood movies we already know, they are collaborating with Prague’s Film an TV School (FAMU) to support local talents and film students by screening their work – for you to enjoy. Exhausted from all the wonderful pieces and the adventuring, Pragovka’s in-house coffee – Kafe•Pragovka – with its beautiful outside seating area along with the trendy and cozy interior invite coffee lovers to try their filtered coffee but also hit the spot of all those looking for a summery iced drink or – as we are in the capital of it – a freshly draft beer! What better place to ponder and think about the impressions than Pragovka’s in house café? Are your explorer’s senses tingling yet? Don’t wait any longer! Dive into the beauty of Vysočany’s wonderland right here!